Some time ago I was contacted by a copper about the mysterious disappearance of my ex wife’s father’s chair, from my house. The useless copper insisted he was going to do something about the disappearance of this chair, from my house, despite the fact that it was MY HOUSE and I hadn’t reported anything missing. Obviously he didn’t actually do anything… shock horror, as we all know the police are utterly useless. But then, what could he do? The chair was dumped in my house… mine!!! 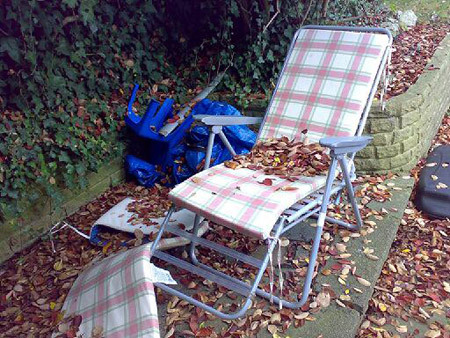 Well, if this photo is anything to go by, the chair has resurfaced, though I’m not sure where. Maybe this is in Cardiff, maybe it’s in Manchester, maybe it’s in Nantes, London, Berlin or Kenya. Who knows where this is, or if indeed it’s THE actual chair. All we know is this: it’s a chair, and it’s NOT in my house.